Larentz wanted to replace a paper system for daily job reporting and managing field personnel with a simple to use, robust and automated solution that reflected the company’s current business processes. Flowfinity Actions is used to handle daily job reporting, provide up-to-the-minute updates to customers, and instant access to an essential list of current municipal construction standards. "Flowfinity Actions allows us to easily keep track of where crews are during the day and what they are working on. With better management of man hours, equipment hours, and materials handling, we’re able to cut costs and improve our competitive position," said Tim Zapf, Durable Markings Manager, Lafrentz. "With better management of man hours, equipment hours, and materials handling, we’re able to cut costs and improve our competitive position." 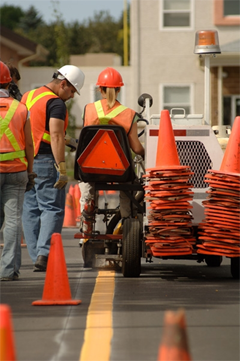 Lafrentz has been Western Canada’s leading road marking company for over 30 years. The company’s profitability depends on keeping projects on time and on budget while providing excellent customer service. With a number of crews working in the field at all times, effective management of these crews is essential to maintaining competitive advantage. Until recently, the company’s crews had to fill out handwritten job reports including materials reports and time sheets and fax them in at the end of each day. This was seen to be inefficient and error prone because crew leaders had to remember the information and wait until the end of the day to fill out paper reports. At times the company suffered from data loss because crews were working in remote areas. Increased administrative costs were incurred dealing with incomplete or illegible reports. Further complicating the task are construction standards that vary by municipality, increasing the chances for re-work if a job was not done to code. Lafrentz decided to use Flowfinity Actions to eliminate paper reporting by their field personnel. They liked the solution because it was quick to set up, flexible, and easy for their crews to use. 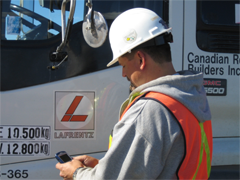 With Flowfinity Actions, Lafrentz set up paperless reporting to accurately and efficiently manage their crews. The system was up and running in just two weeks. Instead of writing paper job reports, crews are now able to select entries from dropdown menus on their smartphones, saving time and improving accuracy. Using a wireless handheld solution, Lafrentz crews are able to fill out reports whenever and wherever they are, with or without network coverage, and reports are submitted as soon as coverage becomes available. After paper reporting systems were automated, Lafrentz took advantage of Flowfinity Actions for maintaining synchronized, up-to-date information that field personnel needed. Previously, each person kept their own address book, without a centralized list. Now, Flowfinity Actions is used to provide the crews with an up-to-date contact list, eliminating the need to spend time updating contact information on their own. Crews also work in a number of different municipalities, each with their own road construction standards. Crew members need access to these standards to ensure compliance and avoid costly re-work. To facilitate this, Lafrentz has made a catalog of municipal standards available on their smartphones. Now crew leaders have immediate access to up-to-date lists of standards that they can refer to before starting a job. These lists are maintained within Flowfinity, from a centralized location, reducing the cost of administrative overhead. Customers used to have to wait until a report was faxed in and often until the next day to learn the status of a job. Now, Lafrentz can keep track of where their crews are during the day and provide up-to-the minute reports to customers. Lafrentz has received several awards for their leadership in safety for providing improved working conditions and reducing lost time claims. Before, safety reporting was done though paper reports faxed in at the end of the day. At times safety reports would be incomplete, inaccurate, or lost as crews dealt with the challenges of working out of trucks in varying conditions. The company was easily able to leverage the Flowfinity Actions solution to automate safety reporting to report accidents and near-misses directly from the field, when they happened. "Now incident or near-miss reports go directly to the safety officer for immediate follow-up and investigation if necessary, also keeping us compliant with safety reporting requirements," said Zapf. "Now incident or near-miss reports go directly to the safety officer for immediate follow-up and investigation if necessary." Field personnel and their managers aren’t the only employees benefiting from Flowfinity Actions. The accounting department previously received hand-written reports and had to verify information before inputting it into the accounting system. Now, supervisors can easily check forms as they’re submitted, and as a result there are very few errors for accounting to deal with. The sales department also uses the system for quick and easy call reporting. Flowfinity Actions provides a solution that can be easily tailored to meet the needs of different departments within an organization. Flowfinity Actions allows us to easily keep track of where crews are during the day and what they are working on.